Chop the chicken into chunks. Heat the pan on a high heat. Add the chicken and immediately turn the heat down to medium. Cook until slightly brown and then turn the heat right down to cook the chicken through, stirring from time to time. Once cooked remove and set aside. Mix the creme fraiche with the mustard, water and herbs and add to the pan with the chicken. Add the frozen peas and bubble until cooked through. 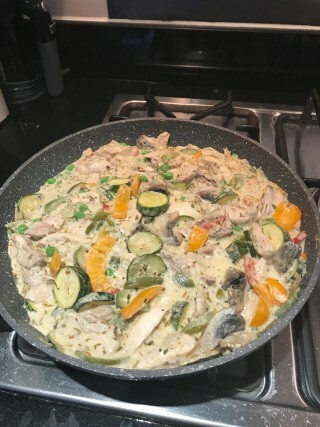 This entry was posted in Recipes and tagged high fibre, high protein, low calorie, low fat, low salt by Stephanie.fade. Bookmark the permalink.